Speed is everything in today’s digital landscape. We live in a time where we have everything the web has to offer at our fingertips. Not to mention, we have it in abundance. When Mighty Fine was just starting out, this was something we quickly realized has extraordinary value and we became obsessed. Besides having an excellent design to make the right first impression, you need fast loading web pages to stay in the game. With any given search engine, you can get hundreds of results within less than a second. That’s partially why the web is so unforgiving when it comes to website speed. As a result of having so many options, our attention spans have become relatively limited for content. Having a fast loading website makes for Happy Customers. Web pages that load quickly perform better on all fronts: more engagement, higher conversion, and better user experience. People have become increasingly skilled at parsing content on the web. We scan for context and decide whether the content is worth our time. Faster page speeds maintain a person’s flow and allow them to efficiently scan your site which motivates them to look through more of your pages. We judge the performance of a website by how long people stay on a site and the number of pages they visit. Google also tracks this information and uses the data to determine a site’s ranking. That’s why your website’s speed is so important. The reality is, there are many other similar services and products out there like yours. As a result, if a site is taking too long to load, why wait? You can simply bounce to the next option. You want to avoid having your visitors bounce from your site because it took too long to load. Want to share this infographic on your site? Copy the embed code below! Please include attribution to Mighty Fine Design Co. with this graphic. Wondering how to improve your page speed and to stop customers from bouncing off your website? No worries. We have you covered. Are You Ready to See How Your Website is Performing? Be careful, this can become an obsession. You can do a performance check yourself by using GT Metrix. You simply need to input the URL/webpage you are testing. You will then receive a Page Speed Score and it will also display how long it takes your site to load. Your target should be under 3 seconds. Don’t worry if you get a failing grade any competent developer can optimize your site after the fact. Optimizing your website will give you a leg up on the competition and it’s great for SEO. More than just your customer’s and client’s experience, having a speedy website is also important for how you rank on Google. The better your page scores regarding speed, the more likely the Google algorithm is to bump up your website on relevant searches. Don’t forget to also take into account how fast your website works on mobile devices. Starting in July 2018, this became a standard for how Google ranks websites when searching from mobile devices. This is especially important, according to Google themselves, more searches take place on mobile devices than on computers. Google, like every other business, wants to deliver good user experiences. That means they are looking to you to provide a quality experience. As it turns out, the old adage holds true for your page speed—time is money. We’ve learned that having a quicker website leads to stronger visitor retention, and to convert those visitors to customers. Additionally, we know the inverse is true as well. 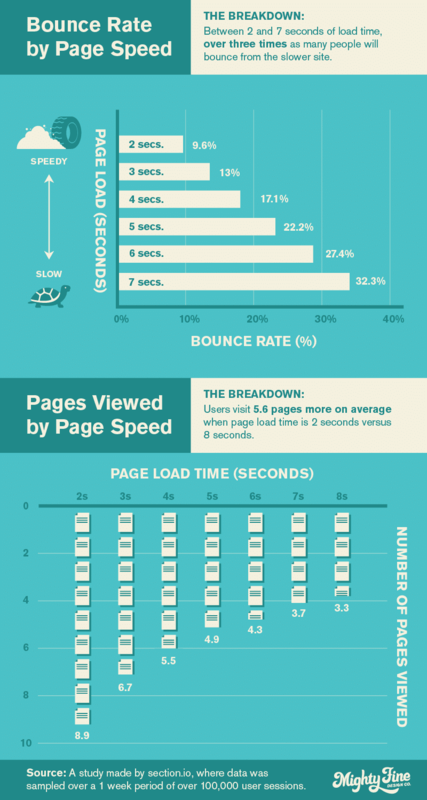 Slower page speeds can impact you negatively, and cause your visitors to bounce and find other alternatives. Having a slow website can be concerning for your business. That’s why we’re here to help. Let us know if there’s any way we can help you get the speed your website—and customers—deserve.